Dehydration means that a child’s body lacks enough fluid. Dehydration can result from not drinking enough water, vomiting, diarrhoea or any combination of these conditions. Rarely, sweating too much or urinating too much can cause dehydration. Infants are much more likely to become dehydrated than older children or adults, because they can lose relatively more fluid quickly. Dehydration is most often caused by a viral infection that causes fever, diarrhoea, vomiting, and a decreased ability to drink water or eat food. 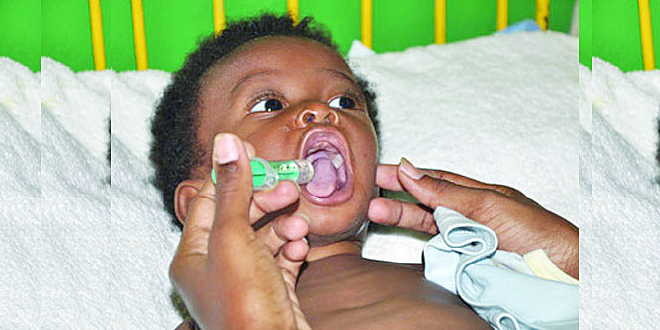 Common viral infections causing vomiting and diarrhoea include rotavirus, Norwalk virus and adenovirus. Sometimes sores in a child’s mouth (caused by a virus) make it painful to eat or drink, which helps to cause or worsen dehydration. More serious bacterial infections may make a child less likely to eat and may cause vomiting and diarrhoea. Common bacterial infections include Salmonella, Escherichia coli, Campylobacter, and Clostridium difficile. Parasitic infections such as Giardia lamblia cause the condition known as giardiasis , which can lead to diarrhoea and fluid loss. Increased sweating from a very hot environment can cause dehydration. Excessive urination caused by unrecognized or poorly treated diabetes mellitus (not taking insulin) or diabetes insipidus are other causes. Conditions such as cystic fibrosis or celiac sprue do not allow food to be absorbed and can cause dehydration. Be concerned if your child has an excessive loss of fluid through vomiting or diarrhoea, or if the child refuses to eat or drink. Signs of dehydration are sunken eyes, decreased frequency of urination or dry diapers, sunken soft spot on the front of the head in babies (called the fontanel), no tears when the child cries, dry or sticky mucous membranes (the lining of the mouth or tongue), lethargy (less than normal activity) and irritability (more crying, fussiness with inconsolability). The doctor will perform a thorough history and physical exam in an effort to determine the severity and cause of the dehydration. Specific laboratory tests may be ordered. A complete blood count may identify an infection. Blood cultures may identify the specific kind of infection. Urinalysis may identify bladder infection, may give evidence of the severity of dehydration, and may identify sugar and ketones in urine (evidence of uncontrolled diabetes). In some cases, the doctor may order other tests, such as a chest x-ray, a test to check for rotavirus, stool cultures, or lumbar puncture (a spinal tap).